This is my first expedition where my two daughters fully grasp what their daddy is up to. Leaving them is the hardest thing for me and the one I reflect on the most. Being away from my kids for any length of time is difficult but, up here, in one of the remotest and hostile environments on earth, it really weighs heavily on my mind. I decided to undertake this expedition because by doing it myself and my teammates can make a strong statement in the battle against climate change. Doing it is very important to me. It’s far easier for me to explain this to my girls, that I acted on my passions, than to lament to them that I didn’t act on my passions because of them. It’s been a struggle over the last couple weeks for our team but we’re all fully in the moment, thoroughly enjoying the experience. Reading the myriad of comments being posted on various forums and social media about the expedition – both positive and negative – we know we’re reaching people and sharing our message. Disparaging comments are as valuable as supportive ones as they raise questions and encourage dialogue and debate. The fragility of the arctic environment can’t be overstated. It needs to be protected. Many readers may wonder what the clothing kit for an team of Arctic rowers might look like. 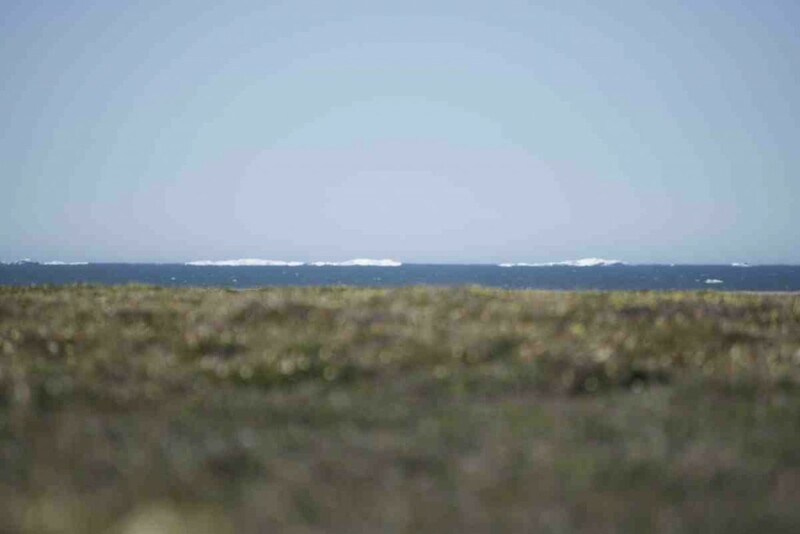 The environment on the North West Passage is very windy and cold with the temperature of arctic waters being just a hair above freezing – survival in them is defined by minutes not hours. Our rowing outfit has to be warm, water and windproof to combat the elements while still being breathable enough to deal with the moisture generated from our hard physical labour. This is no easy requirement and is the reason why we’ve gone with a very special outfit uniquely suited to the conditions. Our inner layers consist of heavy wool socks on the feet and a combination of MEC underwear and fleece on both top and bottom. The idea here is to have the underwear whisk away the moisture from the skin and the fleece to provide insulation. Over this we slip ourselves into arguably the most important piece of clothing we have: our one-piece Ocean Rodeo drysuits made locally in Victoria, BC. With fully integrated sock system, the suit only has gaskets on wrists and neck, the neck gasket being removable when additional ventilation is required. I couldn’t imagine undertaking a cold water expedition without such a piece of gear. We protect our feet with either a pair of MEC neoprene Moque booties – typically when we’re in the water towing – or insulated rubber boots when rowing. On our hands we don MEC Humboldt neoprene gloves and a neoprene Noque toque. We round out our rowing kit with a pair of Native Eyewear polarized sunglasses to cut the glare of the water. When resting in the cabin we have an assortment of warmer items including an MEC down hoodie and additional fleeces, socks, hats and underwear to keep things cozy. Our sleeping bags are our final defence against the cold and we’ve chosen the MEC Phoenix Hybrid -20C for the job. This is a mix of 40% down and 60% synthetic fill giving a perfect balance of weight and water robustness that this mix provides. To fully combat the moisture that builds up in our cabin we slip our sleeping bags into a Helsport sleeping bag cover that is waterproof on the underside and water resistant – breathable on the top. Helsport bag liners add additional warmth and comfort to the mix. We aren’t carrying much us on this adventure but the things we do have are carefully considered, robust and effective. For me, an expedition like this really does illustrate how insignificant I am in the grand scheme of things. I find these sort of trips very humbling as they always expose one’s natural vulnerability to the elements. Yesterday while struggling to push the boat through the water and then later trying to row her into stiff headwinds, my thoughts shifted to my own energy levels and the concept of renewable energy in general. We have two 12V batteries on board our boat and these are recharged via solar panels on the roofs of both cabins. This is our only source of power on this trip and so far it has worked very well to power our navigational equipment, water maker, laptop and satellite phones. I’m not an expert on renewable energy (and will never claim to be) but experiencing the raw power of Mother Nature over the past two weeks, I do wonder why we don’t harness renewable energy sources more than we do. Surely there’s a bigger place at our energy table for renewables. Our strategic corporate partner for this expedition is Mainstream Renewable Power, a company that builds wind and solar farms all over the world. The reason they chose their name is because they want to make renewable energy Mainstream. I’m not just mentioning this to promote Mainstream as a company, I just think it makes sense to use natural resources as much as possible for our power needs. Given the nature of this expedition, my eyes have been opened up significantly over the past 18 months to how rapidly our climate is changing. Regardless of peoples’ opinions on this topic, hopefully our trip helps to promote more discussion on this very important issue, that not only affects all of us, but will impact future generations probably even more. Please do have a look at our climate change petition and add your signature to it. Also feel free to circulate it to any friends and family who you think would be interested. I’ve just come off my last session on the oars so time to get some sleep and try to recharge my own batteries before my next shift in three hours……. Winds remain unabated through the overnight hours. Frank wakes up periodically and slips out of the cabin to see if there’s been any change. By 5:00am there’s a slight easing to our Easterly blow and we decide to make a move. 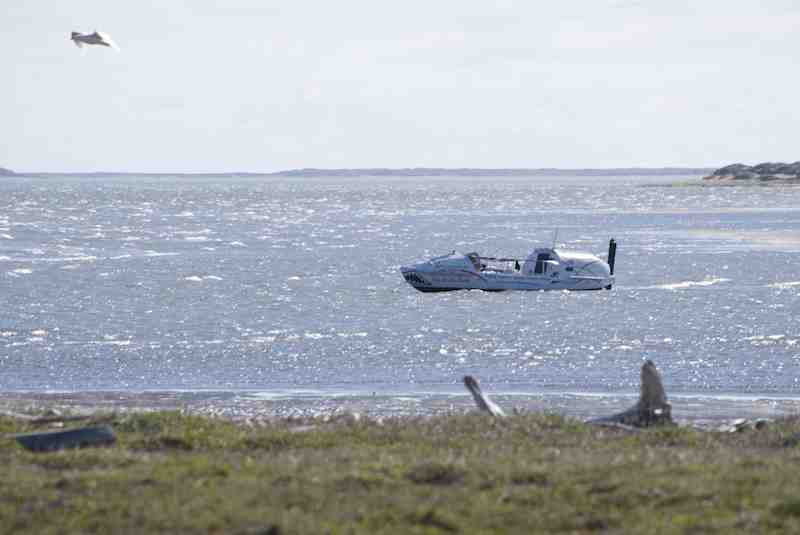 We’re stuck far out on a small islet, fully exposed to wind and weather, with our options few. Moving towards the mainland is essential for us to garner some lee protection for rowing or a for some beach surface to haul along. This is what it’s come to, clawing forward no matter how preposterous or slow. Frank and I ferry from our island perch to a series of smaller islets that provide a semblance of protection from the ever present wind. The crossing is exhilarating and fast, dark rollers sweeping beneath our bow, their tips frothing, their valleys deep. It’s a glorious morning with a wash of radiant ochre bathing everything in an animated glow. 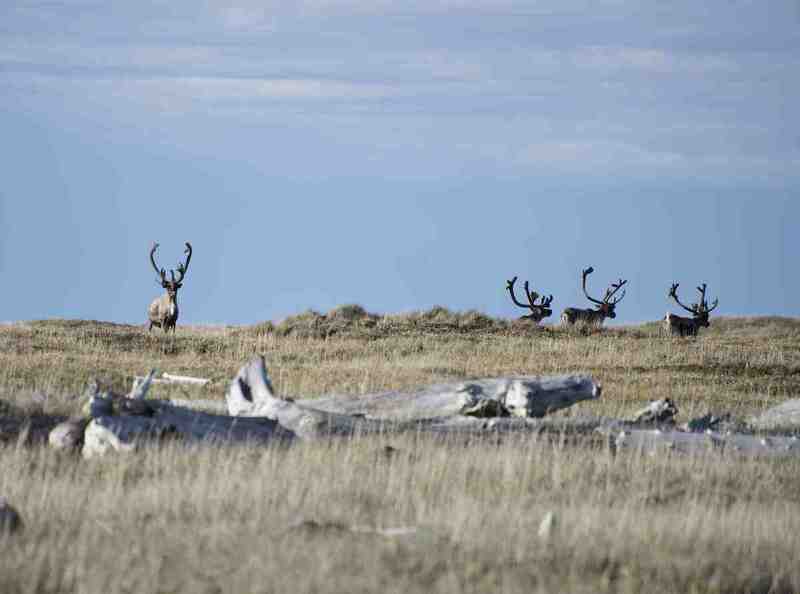 On a small islet we notice two large caribou staring intently at us, antlers soaring and provocative, their stance exuding an air of astonishment. We would see countless more caribou over the course of the day, often a forest of antlers being the only hint of the animals in repose. Our Easterly shifts to a North Easterly and we begin to make some guarded process behind the oars. We make two larger crossings across heaving bays of marching rollers and pull back a little lost mileage. Movement buoys our spirit. My last shift with Denis consisted of zero rowing. We started rowing but were making no progress due to the stiff headwinds so we spent three and half hours pushing the boat through the shallow water – we made 5.5 km in four hours. If we had calm conditions, we could row this in one hour with far less effort. Over this time, my mind began to wander and realizing we can control so little up here, I began thinking about what we can control. My thoughts drifted to things we can do to give ourselves the best chance of moving forward. It’s probably stating the obvious but all we can control is our actions and nothing else. I suppose when you think about it, this is no different from life in general. How I (or anybody else) performs in life is really down to focusing on what one can control. Whether it’s on this expedition, in my business or just life in general the only thing I can really control are my actions. There are so many things beyond my control so why bother worrying about them – like the actions of others, what anybody says or thinks of me, the economy…….the list is endless but yet it’s so easy to allow things like these occupy our head space. I know from experience doing a lot of little things right on a consistent basis can yield significant results over time. So for now in my current environment, this means focusing on certain tasks at hand. Like trying to keep clothing as dry as possible, doing things in my “off shift” time to keep my spirits up. Making sure I keep myself well fed and hydrated. Maintain equipment as best we can so that it helps us as we intended. A small example of this was when I noticed a hole in my dry suit today which was allowing water in. Frank has a repair kit with him for this so we patched that up – that was something we can control. As we are currently stuck on anchor, we all took the opportunity to hang some damp clothes out to dry – this is also something we can control. I know these might sound like little things and probably very obvious but its very important for us at the moment to focus on these things we can control and not allow things that we cannot (like the weather conditions) get the better of us mentally. The bottom line for us right now is to simply do everything we can to give ourselves the best chance of positive outcomes, this is all we can do and the rest is out of our hands. It definitely adds a certain dimension to this trip, which is kind of cool. I suppose, in a way, the concept of control for us up here in the Arctic is no different than what it is back in Vancouver. Focus on how we as a team perform and results / outcomes will look after themselves……. We’ve all brought reading material for our journey and good thing too with the forced layovers we’ve been experiencing. Three books of most interest doing the rounds in the cabin are Pierre Berton’s Arctic tome: “The Arctic Grail: the quest for the North West passage and the North Pole 1818-1909″, Bruce Macdonald’s “North Star of Herschel Island” and Barry Lopez’s modern masterpiece of Arctic observation “Arctic Dreams”. The one concept we’ve gleaned from these books, defined by the simple statement put forward by Lopez, is “to travel in the arctic is to wait”. Historical expeditions through the Northwest Passage were always defined by long episodes of waiting, waiting for weather, waiting for ice, waiting for the passage to let them through. Our expedition is no different. And so we wait. The limiting factor for us – so far anyhow – is not the ice choking the route ahead but rather the wind strafing it. For a vessel under sail or motor the winds hampering us now would be of little consequence. But for our human powered row boat strong easterlies and north easterlies stymy us, claw at our speed, gnaw at our souls. If I think back to the toughest moments of my expeditions of past, they always seem to revolve around a forced holdup: tent bound just a stone throw from the South Pole, running out of food, running out of time; storm bound on the edge of Bering Sea ice, needing to cross it, it ready to break up; flooded out on a running expedition across South America, almost finished and no route through. All episodes frustrating, all episodes out of our control.